Arriving in May and June direct from the hatchery they are cared for by dedicated stockmen who take pride in their work. Once old enough they are left to wander in ancient woodland and basically as with the geese do as they please, not harassed and just living naturally. They have access to straw-bedded barns at night, but quite often choose to sleep outside depending on the weather. Great Grove Poultry is a traditional family run farm. All of our Norfolk Turkeys and Geese are free to roam around our 35 acres of Norfolk woodland and grassland enhancing a stress-free environment. 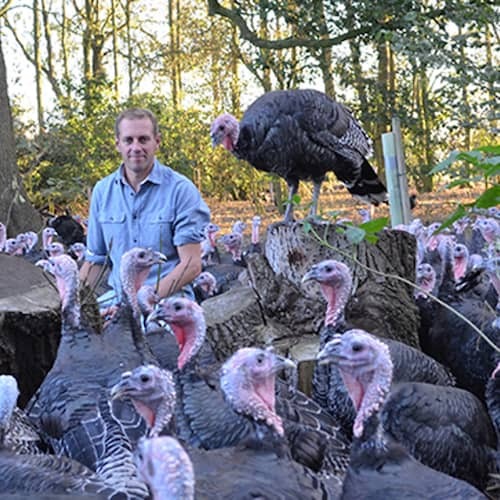 Using an aged old method of farming we allow our traditional Norfolk Turkeys and Geese plenty of time to grow to maturity giving a far superior quality bird with natural gamey flavours. Everything is prepared on the farm, graded and game hung in large chillers (minimum 10 days) to make them exceptionally tender, adding all the natural flavours that this type of production depends on.